There was no snow or ice. I was not in a hurry. I was not distracted by my phone or iPod. I did not faint and then fall. I was wearing flat shoes that are old friends. There was no obvious reason for this to happen. Fortunately there was no other damage so I picked myself up and carried on to my appointment. On my way back to the car, I took the same route to see why I’d tripped on the ramp. I noticed that the front edge was about 3/4 inch higher than the pavement. My toe caught on that very small lip. Go figure! As I’m inclined to do, I wondered about why this happened and what there was for me to learn. Clearly it wasn’t to be more careful or to wear safer shoes, so I left the question open and carried on with other things. About a week later, it hit me. An assumption had tripped me up. When I saw the ramp from a distance, I assumed there was a seamless transition with the pavement. There wasn’t. But I proceeded on the basis of my assumption and experienced the consequences. Then I started wondering if this is a metaphor that goes beyond curbs and black eyes. What other assumptions do I make, and how are they tripping me up in various aspects of my life—work and relationships, for example. I’m on a mission to become aware of these assumptions over the next few weeks. Wellness is another area of life where our assumptions trip us up. The consequence usually is that they prevent us from taking charge of our health. Here are a few of these limiting assumptions and fresh perspectives to think about. This entry was posted in Fresh Perspectives, Mindset, Viewpoints & Thinking for Ourselves, All Posts—newest first and tagged mindset, fresh perspectives, Pick Yourself Up, taking charge of your health, Ginger Rogers, assumptions, limiting assumptions by Laurana Rayne. Bookmark the permalink. I so enjoyed this blog! 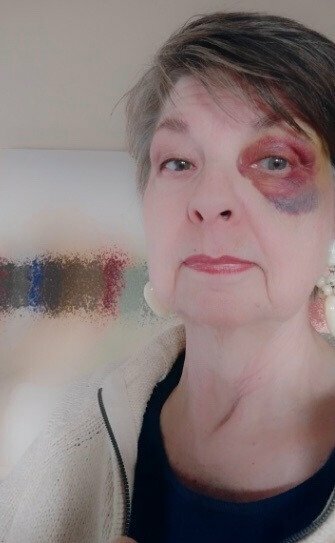 I relate to your experience that resulted in the magnificent black eye, although my bruises were on a less visible part of my body! This is such a wise and practical perspective. Our assumptions do indeed “trip us up” and get us into all kinds of trouble. Thanks so much, Nora. This is indeed high praise from someone with your life experience and professional training.